Michigan Hops Farm: Black Creek Hops gets a "sheep"
Black Creek Hops gets a "sheep"
After the hops were all trained on their new strings it was time think about managing all of that unwanted vegetative material growing next to the hops bines. Our field mower does a nice job of mowing down the cover crop between the rows but does not get close enough to the hops plants. 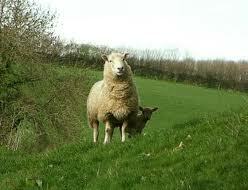 Internet research has informed us that a popular method of weed control in hopyards is to use grazing sheep. There are even some feasiblility studies being done in this country to see if this is a good method of weed management. You have to admit, they are pretty cute. Here is our new "sheep" It even comes with a name, "Stihl"
It stands still, doesn't require much care and isn't particularly susceptible to coyote attacks. Shepherding isn't too demanding either. "Stihl" isn't paricularly fussy about what it eats...it will eat big thistles. A job well done. Nice neat rows of 2nd year hops . Thanks, Stihl.